You have added Golden Glow Lace and Tulle Embellished Party Dress into shopping cart. You'll have the midas touch in this gorgeous pale gold party dress. 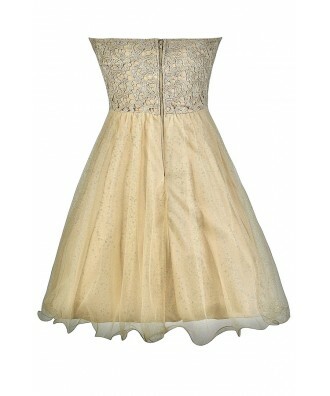 The Golden Glow Lace and Tulle Embellished Party Dress is fully lined. It has a strapless sweetheart neckline, lightly padded bust, and an empire waist. 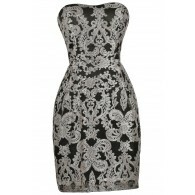 The top of this dress is made of a pale gold crochet lace. The attached skirt is made of gold tulle with tiny glitter sparkles throughout. An invisible layer of tulle under the lining of the skirt adds volume to this look. A band of rhinestone and seed bead embellishments at the waist adds the perfect extra touch of sparkle. A hidden back zipper completes this dress. The Golden Glow Lace and Tulle Embellished Party Dress is perfect for your next semi-formal event. This would make a lovely prom dress or Homecoming dress! Pair it with beige or gold strappy heels. Details: Fully lined. Lightly padded bust. Hidden back zipper. 90% rayon, 10% metallic. Contrast: 100% polyester. Lining: 100% polyester. Hand wash gently inside out cold water. Do not wring or twist. Do not bleach. Dry flat. Do not iron glitter. Do not dry clean. Size 3 measurements: Length from top of bust to hemline: 29". Bust: 32". 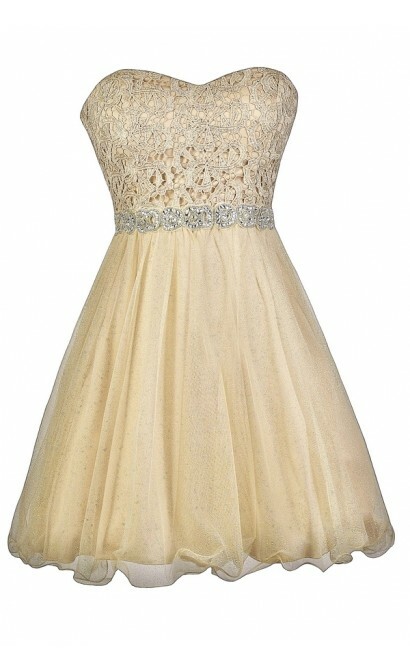 You have added Golden Glow Lace and Tulle Embellished Party Dress into Wishlist. You have added Golden Glow Lace and Tulle Embellished Party Dress for Stock Notification. 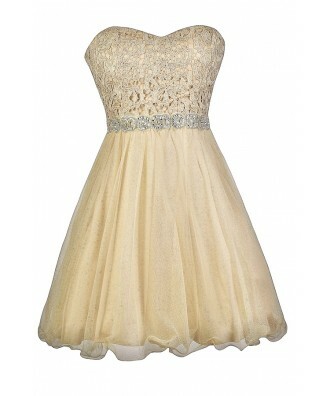 You have set Golden Glow Lace and Tulle Embellished Party Dress as a loved product. You have removed Golden Glow Lace and Tulle Embellished Party Dress as a loved product.